There’s nothing like this fragrantly spiced cake for breakfast or as a snack in the late afternoon. 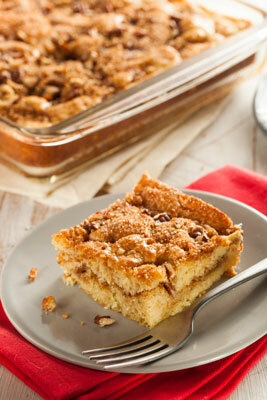 Traditionally, this streusel-topped cake is made with plain yogurt or sour cream. The batter can also be used for muffins. In a small bowl, combine the nuts, brown sugar, cinnamon, and nutmeg. Set aside. Preheat the oven to 350 degrees. Spray an 8-x-8-inch baking pan with nonstick cooking spray. In a medium bowl, combine the flour, baking powder, baking soda, cinnamon, and nutmeg. In another medium bowl or in the bowl of a food processor fitted with a metal blade, combine the sugar and butter. Beat with a mixer or pulse the processor until blended. Add the eggs, yogurt, and vanilla extract and blend. Add the dry ingredients all at once to the wet ingredients in the bowl or food processor. Stir with a wooden spoon or pulse the processor a few times until just blended. The batter will be thick. Spread the batter evenly in the prepared pan. Top evenly with the walnut mixture. Bake until a toothpick inserted into the center comes out clean, about 35 to 40 minutes. Cool on a wire rack for 10 minutes and serve warm or at room temperature. Make spiced streusel muffins. Fill muffin tins 1/2 to 2/3 full and top with the streusel. If all the muffin cups aren’t filled with batter, fill any empty cup with water so they bake evenly. Bake until a toothpick inserted into the center comes out clean, about 20 to 25 minutes. Makes 12. Per serving: Calories 159 (From Fat 45); Fat 5g (Saturated 2g); Cholesterol 42mg; Sodium 135mg; Carbohydrate 25g (Dietary Fiber 1g); Protein 4g.